The Color Protection Moisturizing Shampoo has organic components such as natural seed oils for hydration. It also has natural plant extracts to boost moisturizing. 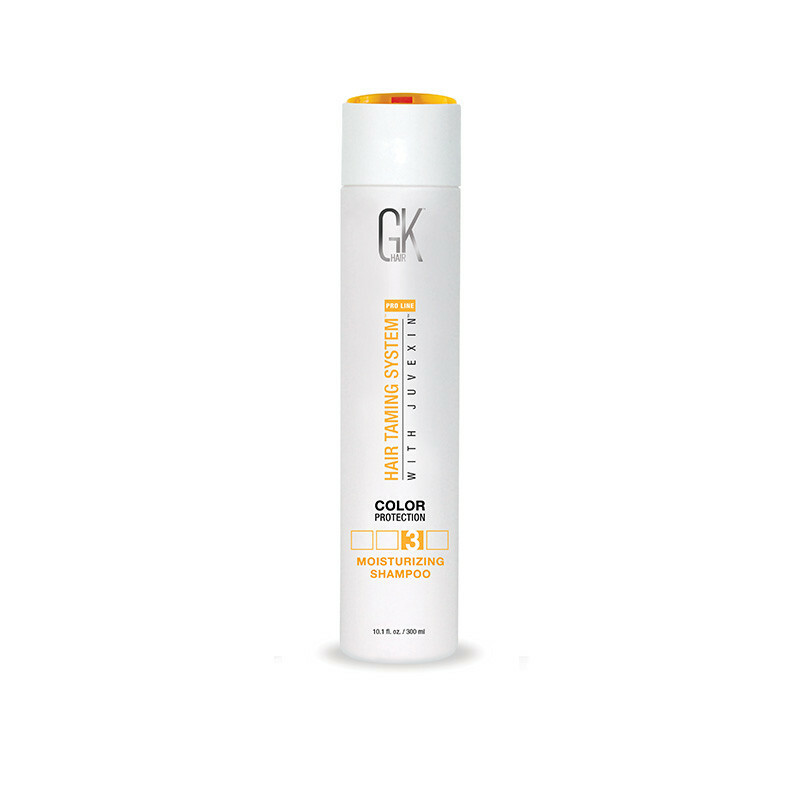 The GKhair Color Protection Moisturizing Shampoo gently cleanses the hair. Designed especially for normal to dry or colored hair types, the Color Protection Moisturizing Shampoo effectively nourishes and moisturizes the scalp and hair while protecting your color. Infused with Juvexin, a Keratin anti-aging protein blend optimized to repair, protect and fortify the hair, the shampoo is designed to remove unwanted oil from the hair. The Color Protection Moisturizing Shampoo has organic components such as natural seed oils for hydration. It also has natural plant extracts to boost moisturizing. The natural grain extracts in the shampoo make a protective layer over the hair to prevent them from further damage. The shampoo has no harsh chemicals like SLS (Sodium Lauryl Sulfate), SLES (Sodium Laureth Sulfate), Parabens, Gluten, phthalates or DEA. GKhair Moisturizing Shampoo is composed of NATURAL SEED OILS, PLANT & GRAIN EXTRACTS gently cleanse dry, damaged hair by strengthening each hair strand with natural proteins while hydrating and soothing the hair. With an added feature of color protection and enriched with Juvexin a keratin anti-aging protein blend optimized for restoring hair from the inside out, returning it to a more youthful state. Buy now GKhair Moisturizing Shampoo for dry hair to moisturize hair and color protection. NATURAL SEED OILS 100% accepted by our hair. Deliver hydration to the hair, leaving the hair nourished and conditioned. NATURAL PLANT EXTRACTS Soothes and moisturizes hair of normal to dry/coarse hair types. Delivers gentle natural moisture. NATURAL GRAIN EXTRACTS These natural proteins strengthen the hair to protect each strand against damage. Good shampoo, after treating my hair with the Keratin of the same brand I used this shampoo and it works just fine, thank you seller.